William Galloway was the developer of the Cedar Heights area of Cedar Falls. He purchased 250 to 300 acres of land here from Samuel Rownd in 1909-10 and formed the Galloway Investment Company. This company eventually owned all the land bounded by Rainbow Drive, the Cedar River, Belle Avenue and Parrish Street. Galloway's many commercial interests also included a lumberyard, a manufacturing company and a seed nursery. Cedar Heights was incorporated as a town, with Galloway as mayor. His plat of Cedar Heights included donations of land for the present Lookout Park and the site of a school, where Cedar Heights Presbyterian Church now stands. 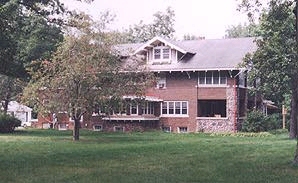 Cedar Heights became part of Cedar Falls in 1935. Galloway's house on Grand Avenue was a 20-room mansion. It was built of red brick with a steel frame, and contained five bedrooms (each with a sleeping porch) on the second floor. Servants’ quarters, a large playroom, six marble bathrooms and oak woodwork made the house one of the area's finest when it was built in 1917. The stone pillars at Edward and Grand marked the entrance to the Galloway estate. Other pillars marked other entrances. Galloway was also instrumental in the development of the Prospect Hills of Waterloo and the Cedarloo section of Cedar Falls. He lived in this house until his death in 1952 at the age of 75. The home has received extensive renovation and is a private residence.